"Naples to Pompeii - taking a train to the lost city of Pompeii in the shade of Vesuvius Volcano is the cheapest way of getting to this museum in the open..."
If you would like to learn about other ways of getting from Naples to Pompeii, jump to our article Visiting Pompeii. That is why we often get questions like: how to get from Naples to Pompeii by train on your own, how to use the local train, how long does it take, how to get to the train station, what is the train ride duration time, the distance and the cost? We will answer your questions in this Pompeii travel guide. Time wise, getting from the Naples train station to Pompeii will come to about the same as with the excursion bus, a taxi or by car...crazy Italian traffic is often not in favor of those who decide to use road transport and think the drive time will be shorter. 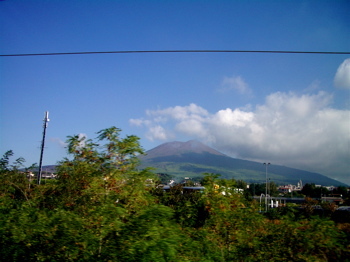 So, how to go about getting from Naples to Pompeii by train? Before we start with directions, keep in mind we do suggest you are one of the first people on the gangway as your cruise ship docks that morning. For a couple of reasons: first, you want to beat all he ships' shore excursion and second, try to see the lost city of Pompeii before it gets too hot and too dusty. Another reason would be because you are very likely to combine visiting Pompeii with some other attractive destination in the Bay of Naples. Unless you are an avid history scholar or an archaeologist, on that day you will want to add something else to looking at Pompeii ruins. You can read about your options in our article A cruiser's day the lost city of Pompeii. As you walk through the big Naples cruise terminal building you will find yourself at the parking lot that connects the cruise dock area with road that runs along the Naples coastline. The city of Naples is practically just across the road. 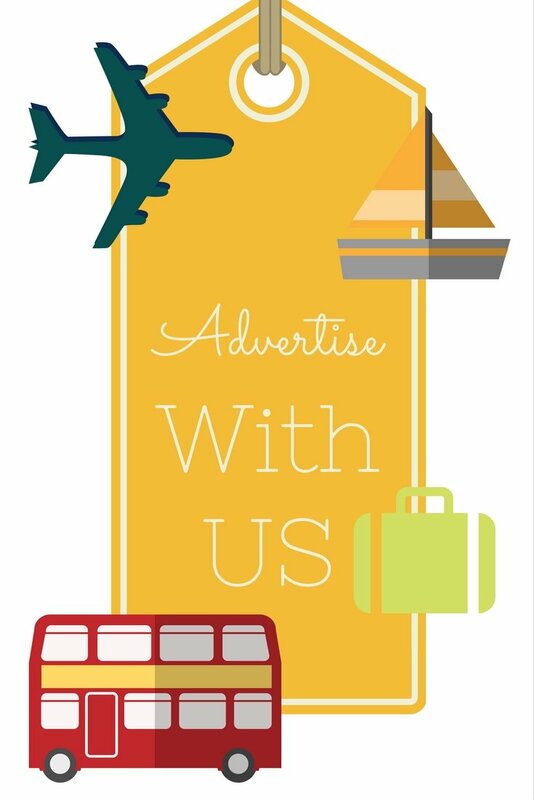 As you step into the parking lot, you will be surrendered by the local taxi drivers looking to take you for a day trip to Sorrento Italy, Pompeii, Amalfi or Positano. If you are looking for a taxi to take you to the Naples train station you won't find one here. These taxis are only interested in taking you for private tours. What you will want to do is walk for 2-4 minutes until you reach the main road on the other side of the parking lot and catch one of the regular taxis often parked in line there. 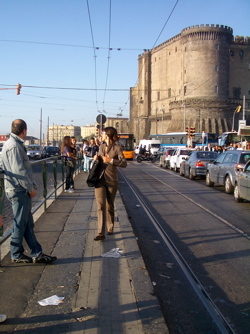 How to reach the Naples train station from the cruise dock? If you're in a hurry to catch an early train, taking a taxi to the train station is a good idea. It will cost you approx. €10. Tell the taxi driver to take you to the Piazza Garibaldi Train station. This is actually the same station as the Naples Centrale Station but it's a different entrance. To check for departure times to Pompeii Scavi, check website that covers the Circumvesuviana trains' timetables in Campania. For the departure locality (Da) choose Napoli Garibaldi (Stazione Centrale) and for the arrival locality (A) Pompaii Scavi. This entrance will take you directly to the tracks that serve the Circumvesuviana train linking Naples, Pompeii and Sorrento, the one you need to take if you want to get to Pompeii Scavi- Villa Misteri station in Pompeii, the one right across the street from the entrance to the archaeological site of Pompeii. You don't want to waste your time taking one of the Trenitalia trains which stop at the station on the other side of Pompeii. It happened to us the first time we went to Pompeii and we had to walk through the town for about 20 minutes until we found the entrance to the excavation site. Naples to Pompeii - Walking to the train station: not recommended at all. The part of Naples you would be walking through is a bit shady, if wouldn't be a very relaxed walk. If you really wanted to brave it, with a cruise terminal building behind you, you would turn right and walk along the main road with the sea to your right for about 15 minutes. Then you would turn left from the waterfront into the Corso Arnaldo Lucci and walk another 15 min until you reached the Piazza Garibaldi train station entrance on your right hand side. 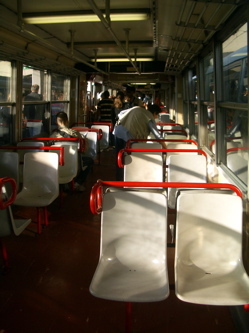 Naples to Pompeii - Taking a tram or a local bus to the train station: on the main road, in front of the cruise terminal building, there is both a tram and a local bus stop. Take either one's number 1 to be dropped off at the Piazza Garibaldi train station in approx. 5-10 minutes. At the Piazza Garibaldi Naples train station you will buy your Circumvesuviana line ticket to Pompeii. The cost will be €3.20 for one way ticket per person. To get from Naples to Pompeii or Hercualneum, check the departure board for trains to Sorrento (Pompeii Scavi-Villa Misteri and Herculaneum/Ercolano are one of the stops on the way to Sorrento) and go to the indicated track/binnario. However, for the most up-to-date Circumvesuviana timetable schedules check here. It takes about 17 mins. to reach Hercualneum/Ercolano and about 35 mins. to reach the Pompeii Scavi stop. The train rides from Naples to Pompeii are not very enjoyable we have to say. They can be full of commuters or local students, the chairs are hard wood not very comfortable to sit on, they are not air-conditioned and you can often be boterhed by the local gypsies begging you for money. So do not leave your valuables lying around! Luckily, the ride from Naples to Pompeii is not very long and you will be entertained with a grat view of the Vesuvius volcano on your left hand side and the Bay of Naples on the right. As you get off the train at Pompeii Scavi, you will be only about 50 metres (164 feet) away from he entrance to the archaeological site. There will be a few restaurants/cafes along the way there where you can have your first morning espresso or freshen up with some lemon granita! The food is quite pricey here so you would be better off planning your lunch somewhere else. Now if you think all of this might sound a bit too complex to think about on your vacation, I hear you. That's why I have researched our trusted tour/shore excursions partner, Viator, for the best options on getting you from Naples to Pompeii. 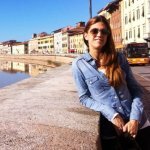 Should I book a guided tour to Pompeii? Although it is possible to do it all on your own, when you think about it, Pompeii, being one of the most important archaeological sites in the world, deserves to be seen in the guidance of a certified local tour guide. So, if you want to be assured of getting the most out of your visit, I would definitely say: yes, go ahead and book it. How do I know what Pompeii tour to take? Well, there are many on offer but for someone who has never been in the area, it may be difficult to decide. That is why I have done all the footwork for you. I have found this shore excursion which has a whooping 4 1/2 star rating on Viator, has very affordable pricing and has great cancellation/money back policy. It is the Naples Shore Excursion: Pompeii Half-day Trip from Naples. What else do I get for my money if I book this tour? 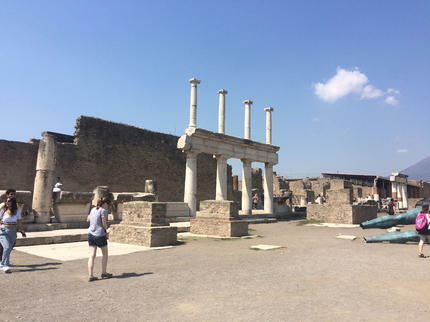 "Perfect excursion for seeing and experience Pompeii during a cruise stop. The tour through Pompeii was GREAT. Out guide provided a wealth of information on the history of Pompeii..."
First of all, I have to tell you, book as soon as you know you will be visiting Naples. With 2-3 ships in the port on the same day, this tour sells out quickly, although it isn't a private tour. Now, click on the image below and it will take you straight to Naples Shore Excursion: Pompeii Half-day Trip from Naples. Click to book and find out more about this exciting Pompeii tour! After you have booked you will receive a confirmation. They accept both the paper or electronic vouchers once you get there. What other options do I have visiting Pompeii? Like Naples to Pompeii Page?